One of my favorite stories about one of my young clients is this: His fourth-grade teacher assigned the students to do a social studies report on the transcontinental railroad as part of their study of western expansion. His mother took him to the library to get the appropriate books. When they got home, she set him up on the kitchen table with the relevant volume of the encyclopedia, the library books, and the art supplies he would need to do a report. Then she set about making dinner. A half an hour later, she went back to check on his progress. He was writing a report about the Great Wall of China! What? It made perfect sense to him. While reading about the railroad, he discovered that much of it was built by Chinese laborers. That took him to the entries on China in the family’s trusty World Book Encyclopedia. He then discovered another long, winding route for transportation — the Great Wall. It did make a kind of sense to his mother. But she also knew his teacher would not be impressed. He wasn’t doing the assignment! He argued that he shouldn’t have to since the Great Wall was so much more interesting. Sigh. Why was her son so difficult? Why couldn’t he see that this kind of behavior was resulting in lackluster grades in school? Why didn’t he care? This was before the diagnosis of Asperger's (now high-functioning autism) became generally known. The boy’s parents knew he was smart. He could read by age 3 and had a vocabulary that confounded many adults. They were pained by his apparent inability to play with age-mates. They had no idea that they were dealing with a twice-exceptional child who, despite his intelligence, faced many challenges. Does any of this sound familiar? Is your child a genius? Or is his highly developed interest in archaeology the obsessive behavior of an autistic child? Or is he both really, really smart and on the autism spectrum? As with the young man in the story, it’s often not easy to tease the two apart. Although unusual, there are kids who are twice-exceptional, burdened and blessed with both qualities. Diagnosis is complicated. Seventy-five percent of people with autism score at 70 or below on intelligence tests and are therefore determined to be intellectually disabled. The other 25 percent presumably have average to superior intelligence. I say “presumably” because giftedness can mask the symptoms of autism, and autism can mask giftedness. Further, gifted kids sometimes exhibit behaviors (like an obsession with facts, intense preoccupation with an area of interest, lack of interest in peers, etc.) that are characteristic of autism. Kids with autism can develop such expertise in their particular intense interest that adults initially miss the fact that they aren’t equally smart about navigating the social world. Accurate evaluation is very important. Teasing out whether a child is gifted and talented, autistic, or both is crucial if we are to provide him with the correct supports and services. Concerned parents need to insist that children be assessed by professionals who are aware of the unique presentation and needs of both diagnoses. Expand her interests. Being able to talk at least a little about many things is an important social skill. Like kids with only autism, twice-exceptional children often have a special interest in a particular subject. I’ve met kids who know everything there is to know about dinosaurs or the solar system or ant colonies or plumbing. You name it. Rather than force a broadening of interests, follow the child’s lead. Let her be the expert and encourage her to teach you about it. Then branch out from the special interest to include other areas. For example: If the interest is dinosaurs, it’s not too big a leap to talk about what happened to them and what we can learn from it as we confront global warming. The object is to expand her range of interests so she can talk with others about things that are of general interest. Peer relationships. Sadly, the twice-exceptional child is particularly vulnerable to bullying. The social deficits of autism make them “odd” to others. They don’t look people in the eye. They miss social cues. They are obsessed with whatever they are obsessed about and aren’t interested in hearing what someone else might want to talk about. Your child needs special, focused training in how to get along with others in his age group. He also needs the relief that comes with being with people like him. Look for other kids who have similar interests or who find your child a little odd but interesting and support those relationships. Sports. Not only does the child who is twice-exceptional have difficulty managing the social requirements of team sports, but she may be physically uncoordinated and awkward. If that’s the case, participating in team sports only sets your child up for more teasing and the loss of self-esteem that comes with being unable to meet the team’s expectations. The answer is in individual sports. If interested, these kids can succeed in activities like hiking, camping and biking. Some do well in activities that are both individual and competitive (like the swim team or archery). The patient coaching and practice needed for mastery are worth it. Doing any activity well increases both self esteem and social options. Pretending. Don’t be alarmed if your child isn’t interested in pretending. Many gifted children with autism aren’t interested in fiction or imaginary play. Their thought process tends to be more concrete and literal. Introduce imaginary play but don’t push it. 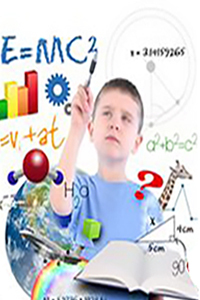 Your twice-exceptional child will be creative in other ways — like discovering a new and advanced approach to a science question. Transitions. Processing speed is sometimes slower than one might expect in a gifted child. Although we live in a world where multi-tasking seems to come easily to average kids, the twice-exceptional child may find this particularly difficult. Once engaged with an idea or activity, these kids have difficulty shifting their focus to another one. Although all children respond well to being given a warning when they have to leave one thing to go to another, the twice-exceptional child needs it even more. Speaking and writing. Many of these children have large verbal vocabularies. At times they present their ideas in an almost professorial tone. But these same kids often have difficulty expressing themselves in writing. It’s as if their minds can’t slow down enough to write out their thoughts in an orderly way. Sentences don’t get finished, for example. Words may get left out. In addition, the fine motor skills that are required for beautiful handwriting seem to be beyond them. Unfortunately, there are teachers who mistake sloppy writing for sloppy thinking. Tablets and laptops come to the rescue. The “cut and paste” function is made for these kids. What they produce can be read without an interpreter. Advocate for your child so that she can use electronics rather than manual handwriting for note taking and assignments. Without help, twice-exceptional children are often misunderstood and isolated. It is up to adult helpers and parents to translate the world to such children and such children to the world. They have special gifts and special needs. With careful coaching and support, they can learn the skills to become connected to others and to be contributing members of their communities. Most important, they can be happy with who they are. Dr. Marie Hartwell-Walker is licensed as both a psychologist and marriage and family counselor. She specializes in couples and family therapy and parent education. She writes regularly for Psych Central as well as Psych Central's Ask the Therapist feature. She is author of the insightful parenting e-book, Tending the Family Heart. Check out her new book, Unlocking the Secrets of Self-Esteem, in early 2015!